Buy GT-Command with headset from dealers: See dealers in the menu to the left. Get inspiration: Sign up for our newsletter in the menu to the left. Why Voice Control? - See the article to the right below latest news. What assumptions? - See Technical info in the menu - and further Tips and Tricks. What does GT-Position do? - See Products in the menu to the left. Fleischmann BR 38 nr 64.111 with Danish types and DCC Loksound decoder from ESU is pulling the goods train from the shunting area. 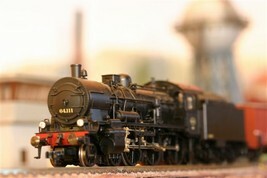 BR 38 is controlled by GT-Command with voice controlled settings of routes, speed, light, and sound. Here doing a transportation task submitted by GT-Games. Uhlenbrock IB-COM does the connection between PC and layout. 1: Yes, we do Märklin, Hobby-Trade, Fleischmann, Pico, Roco, Gauge N, H0/00, 0, 1, G etc..
3: Yes, there is on-line support in the Forum, and we answer the phone. 4: Yes, many different disabilities can use voice control with great advantage. 5: Yes, we interface the layout from the PC using Märklin 60212 - 60215, ESU ECoS, Uhlenbrock Intellibox, IBCOM, Roco 10785, Lenz LZV 100, Digitrax, and many more. 6: Yes, you can use all your files from your test license period when you have bought the GT-Command. Nothing will be lost. 7: Yes, Automation operates together with the voice control - a fantastic combination. 8: Yes, there are 5 games contained in GT-Command, however GT-games with net-trains are not included in the test license. 9: Yes, we have multiuser control with more PC's, more Mobiles like Android, iPhones, or iPad. 10: Yes, GT-Position substitues all the old feed back-modules and do more than that. It tells you in real time where your trains really are.